GeoSwitch is packed with many dominant distinctive features offering approvingly reliable protection for people, critical assets, devices and industrial processes. Delivering highly accurate detection of a strong earthquake or structural vibration with various safe shut down options. GeoSwitch has a broad range of applications such as Industrial Processes, Chemical Processes, Gas Valves, Hazardous Systems, Solenoids, elevators, walkways, Electronic gates and doors. GeoSwitch provides a complete seismic switch system including four rugged triaxial accelerometers organized in GeoSIG RQM™ format and a digital threshold detection circuitry for up to three independent switch levels, output relays, and power backup. 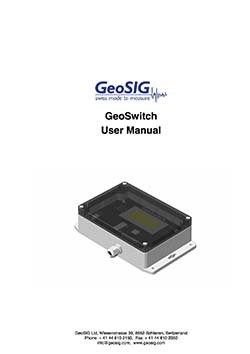 GeoSwitch is housed in a versatile industrial rated enclosure with a single cable inlet for all connections. Ideally suited for accurate monitoring of strong ground motions to control relay contacts at different acceleration levels for warning and/or alarm functions the GeoSwitch provides user programmable set-points over the full measuring range available. Key features of the GeoSwitch include a wide selection of secure user interaction options including the built-in on demand Bluetooth, or the hardware ports of USB and serial MODBUS. The USB console interface conveniently located under the transparent hood of the unit provides the simplest installation and maintenance under any condition using the GeoSwitch Configurator™ software. Compensation for non-level mounting is provided by the GeoSwitch’s sophisticated digital electronics, therefore high-precision leveling is not required.The non-battery and maintenance free backup power guarantees proper functionality even if the power is lost at the moment of disaster. A large and clear multi-line LCD screen as well as system status LEDs are only some of the unique features of the GeoSwitch, which provides clear and immediately useable information about the system status, latest sensor values, list and details of the last several events, as well as any relevant notifications it may provide. 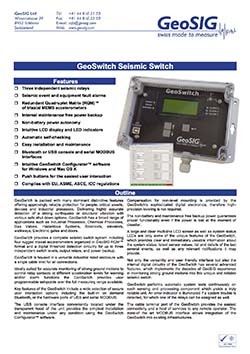 Not only the versatility and user friendly interface but also the internal digital circuitry of the GeoSwitch has several advanced features, which implements the decades of GeoSIG experience in monitoring strong ground motions into this unique and reliable seismic switch. GeoSwitch performs automatic system tests continuously on each sensing and processing component which yields a truly reliable unit. An error indicator is illuminated if a system trouble is detected, for which one of the relays can be assigned as well. The cable terminal port of the GeoSwitch provides the easiest connectivity and a host of services to any remote operator. The state-of the art MODBUS interface allows integration of the GeoSwitch into existing infrastructures. GeoSwitch monitors the ground motions in three orthogonal axes(one vertical and two horizontal). Relay contacts change state (open or close) when ground motion exceeds selected levels of acceleration. Threshold,Threshold & Fault, Vector sum, vector sum & Fault, Power, Fault, Heartbeat. Individually selectable for each channel or on the vector sum of all channels. Up to 3, one per alarm level plus equipment fault on error or other free combination of trigger types. Non-volatile memory retains settings if power is lost. 500 mA at 60 VAC/VDC with typical 10 ms set time. Normally Open or Normally Closed, user configurable. 0.1 – 6553.5 s, reset automatically.0 sec, latched. Continuous self-monitoring. System tests include comprehensive check of sensors, real time clock, supercap charge level, external power and hardware. The unique RQM™ organization allows permanent monitoring of the individual sensor cells and facilitates the use of healthy sensors for earthquake detection, thus minimizes the probability of false / missed alarms. In case of a system problem the user will be informed by an indicator and the assigned relay contact. Additionally system status can be monitored through console or MODBUS interface. A warning indicator is illuminated if user’s attention or maintenance is required. 400 s with maintenance-free supercap; up to several days with optional battery. Demonstrates key parameters including system time and number of registered events for each relay. Can show history of up to 10 last events for each relay. “Up”, “Down”, “Select” (to navigate on LCD). Optional wireless interface for system configuration, listing of PGA values from the last events, link with GeoSwitch Configurator™. UV stabilized Polycarbonate with UL94-HB flammability rating. Optional aluminum or steel housing.